← Why eat your vitamins when you can now shoot them up? I’m not a sedentary person. In my 30s and 40s, I was a runner, and for decades, I played singles tennis three or more times a week. After a back injury in my late 30s, I took up swimming and cycling. Now, in my 70s and with artificial knees, I walk or cycle and swim laps daily, all of which has kept me aerobically fit, free of pain, reasonably trim and energetic. So in combing recently through the professional literature on exercise and bone health, I was quite disappointed to learn that neither swimming nor cycling is especially good for my bones — at least, not the ones most susceptible to fracture. Swimming, in fact, might compromise the strength of those bones because it lacks the tug of gravity. To maintain strength, bones also need the stress of gravity, which is lacking in cycling and swimming and not as powerful when walking as it is when running. Being suspended in water is like floating in space for a short time: once they leave Earth, astronauts lose bone. But before I was too discouraged (and before you abandon exercises like mine and retreat to your recliner), I did some more research. Regular walks can indeed offer some protection against hip fractures among women (and presumably, men) of a certain age, I found. In the famous Nurses’ Health Study, which has followed tens of thousands of postmenopausal women for decades, those who walked for at least four hours a week were 40 percent less likely to suffer hip fractures than those who walked less. Those who walked for at least eight hours a week (or did the equivalent amount of another activity) were as unlikely to suffer hip fractures as women on hormone replacement therapy, long known to protect bones. As a bonus, walking briskly for exercise also lowered the women’s risk of developing heart disease, diabetes and stroke. Activities like walking may not be perfect bone-builders, but they are far better than doing nothing. “As a bone doctor, I’ll take anything,” said Dr. Vonda Wright, an orthopedic surgeon at the Center for Sports Medicine at the University of Pittsburgh. Her studies of 3,000 athletic seniors, whom she described as “normal people,” have shown that even in their 70s and 80s, they are able to maintain bone densities higher than the general population’s. Still, she emphasized the need to “bash our bones” to make and keep them strong. This can be done, she said, through “dynamic impact” — by hopping or jumping rope 100 times a day, for example — or through “positive stress” by walking rapidly uphill or upstairs, or even standing on the pedals while cycling uphill. Although many bone experts recommend weight-training on resistance machines like those found in gyms, Dr. Wright realizes that most older adults won’t or can’t join a gym. Or, like me, they simply don’t like machines and won’t use them regularly. Rather, she recommends home-based exercises that more closely mimic how the body functions in the real world. “The house or office can be as effective as a gym,” Dr. Wright said. Without any equipment, you can strengthen your body’s core and multiple muscle groups by doing what trainers call a prisoner squat. Stand straight with feet shoulder-width apart, knees and toes pointed forward, hands behind your head and elbows pointed outward. Sink down, keeping your weight on your heels as if you were about to sit in a chair. Rise up with your back straight and repeat, working up to two sets of about 10 squats each. For a slightly greater challenge, the same exercise can be done against a wall using an exercise ball between you and the wall. You can use hand weights, or even hold cans of food, to strengthen the upper body at the same time. Dr. Wright also encourages people to use the stairs at home and at work. Walking up and down 100 steps five times at a fast pace provides both an aerobic workout and one that strengthens bones. Walking rapidly uphill is another option. If jumping rope has some appeal, Dr. Wright suggested using a cordless digital jump rope to reduce the risk of tripping. It also records the number of jumps with each turn of the wrists. If you have access to chest-high water in a pool, lake or seaside, you can build muscle mass and strengthen bones by walking forward and backward and side-to-side in the water, she said. This can strengthen the quads, buttocks and core, providing bone stimulation for the spine and hips and shock absorption for the knees. And don’t forget dancing. “The waltz or swing dance is one of the most popular things I prescribe,” Dr. Wright said. Of course, if your back can handle it, there are many ordinary tasks that can strengthen bones, among them carrying heavy items or small children for short distances. 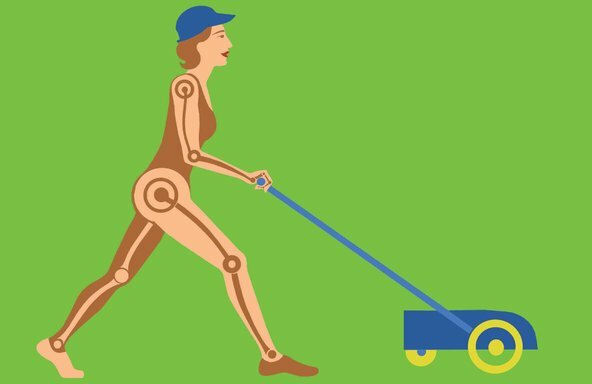 In the warmer months, I do a lot of outdoor tasks — pushing a lawn mower, raking, sawing, digging and the like — that involve intermittent bone-building stress. Bone density exams typically involve only the spine, hips and forearms, the areas most susceptible to compression or fragility fractures. But other bones, like those in the thigh, upper arm and shoulder, can also break under minimal stress if they are weak, so activities that strengthen them — like walking, cycling and swimming — can indeed be helpful. While some doctors think measures of the internal structure of bones may more accurately indicate strength than traditional bone density tests, several experts told me that there is as yet no standard by which to judge bone health based on structure. This is the second of two columns on bone health. The first one can be found here. Posted on October 11, 2013, in Uncategorized. Bookmark the permalink. 1 Comment. It’s great to read that I’m doing the right thing for my body and my bones as I get older!